On wet roads or dry, in heat or cold, through light snow or driving rain, the last thing drivers want to worry about is the performance of their tires. With that in mind, Sumitomo created the HTR A/S P01, the optimal combination of high performance and all-season capabilities for driving confidence when it really counts. The HTR A/S P01 is the ideal direct replacement for original equipment tires on many of today�s most popular performance oriented vehicles. Five-rib directional pattern is optimally arranged for quick and direct steering response. Four wide grooves evacuate water from the center footprint to enhance wet performance. Multiple directional grooves and sipes give more edges to optimize grip on wet and snow-covered roads. A zigzag groove wall improves lateral stability and traction in addition to ensuring water drainage. In tie-bar sipes control shoulder block stiffness and water drainage. great tire. will purchase again. When car sits tires run outoff round till they warm up! Excellent tire for the price! 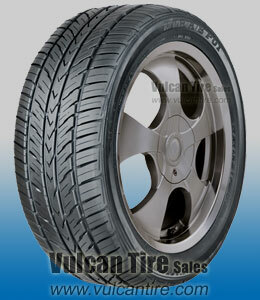 We have been so satisfied with them that the last 3 sets of tire we have put on our vehicle have been Sumitomos. Excellent tire, would definitely purchase again! This is a good tire for the money, fairly quite & tread wear is great, 10,000 miles & still looks new. Really great value. I wanted a performance tire that was quiet, and I was willing to trade performance at the limits for low noise and acceptable winter traction in light conditions. They are indeed pretty quiet, and I drive them on a GTI without any feeling of loss of control or lack of traction. They did really great in some light snow and wintery mix conditions just to get around town. Great tire for the money, but watch out in snow as the grip is average at best even in my AWD subaru. Nice tires, quiet, good traction in turns. Good stopping power as well. Good all round preformance in all weather. (even in North American Winters!) I will be picking them up again.